Keisuke was an excellent guide and translator providing that bridge between the teacher and I.
I had a great day learning Yabusame. I did the three hour class as I thought it would be good to consolidate my skills and I do not regret it at all. The Kawakami family were very friendly and made me feel part of their family and Tomo speaks great English, and as others have said here, could replace the interpreter. However I was glad the interpreter came with me to take the stress off navigating the train system (which with a bit of prep time I could have managed). This was my first time and I was glad with the trainers' support to make some progress. It was very relaxed compared to the hustle and bustle of Tokyo. There was only me there and I was a bit wary of being in the middle of nowhere on an active farm but that soon changed. I was asked if I wanted to rent the traditional costume but didn't have enough cash on me (hadn't yet worked out Tokyo's ATM system) but kind of thought it would have been great for the photos. 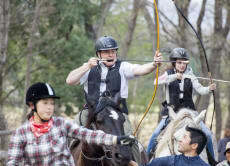 They were very patient with me as I learned how to shoot the arrow and then put the action onto a horse. I had great fun and was buzzing for many days. I have traveled a lot through Japan and many times and I must say that learning Yabusame with this family is one of my highlights. I will definitely book to do this again next time I am in Japan. We did the 2 hour lesson and it was an incredible experience! The staff there were really friendly and even though neither of us had any experience riding we felt comfortable enough to shoot the bow while the horse was running and had a great time! The only downside was that the interpreter was a bit unnecessary on our trip as one of the guys at the place speaks good English and he was the one who explained everything to us, our interpreter basically just held the camera for us so it felt like a needless expense. On another day when he wasn't working though I'm sure the interpreter would be helpful. My lesson was 2 hours long. The class atmosphere was quite causal and relax almost like being taught by family or a friend of grandpa. The class was taught by master, and assisted by 2 people sensei and Tomo-san. Tomo-san was helping with translation and correcting the forms, while sensei was giving tips and tricks. At first we started with practicing archery afterward we moved to horse riding and then to shooting arrows from speeding horse. It was no easy task when combined but it was very fun and exciting experience. I do wish to try again sometime. 2 hours is a basic estimation for traveling to Niihari from Tokyo. However I recommend to travel a hour earlier because the trains out side of Tokyo do not run as frequent. It could took half a hour for transit. I was half a hour late because of the waiting for the train. Nonetheless the scenery from the train is quite nice.